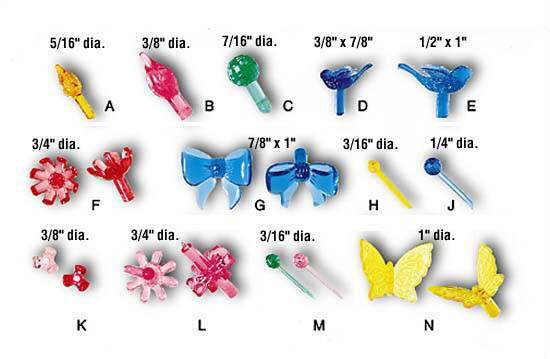 TOP is 9/16"H x 5/16" Dia. 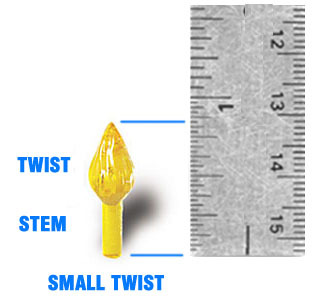 STEM is 3/8"L x 1/8" Dia. 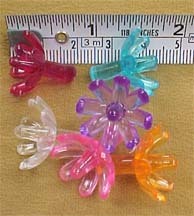 TOP is 3/4"H x 3/8" Dia. 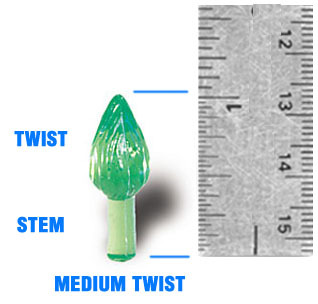 STEM is 3/8"L x 7/32" Dia. 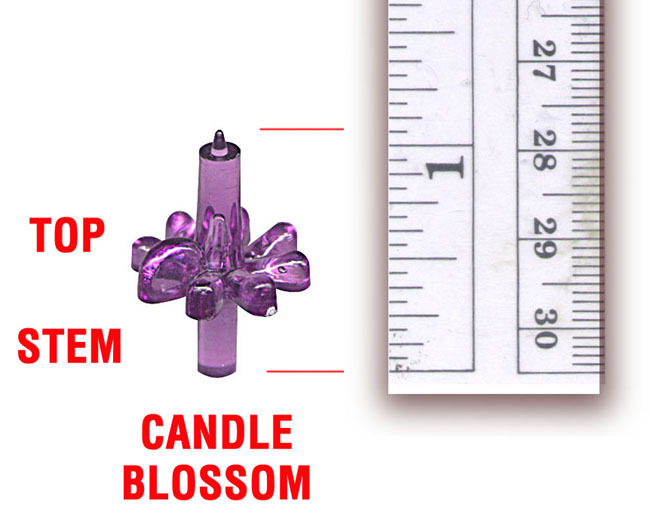 STEM is 3/8"L x 5/32" Dia. 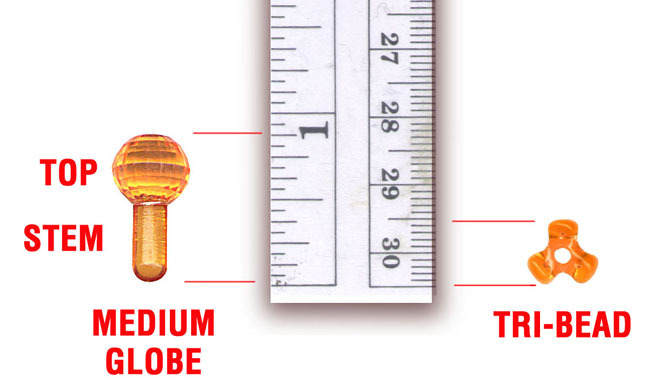 STEM is 3/8"L x 3/16" Dia. 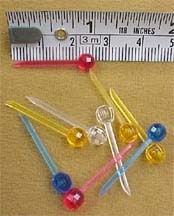 STEM is 1/2"L x 3/16" Dia. 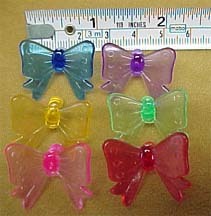 TOP is 4.5mm (3/16") Dia. 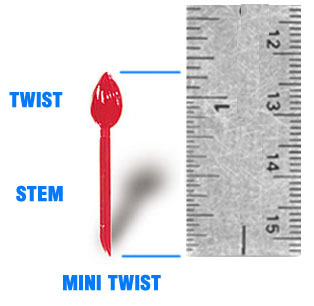 STEM is 3/4"L x 1/16" Dia. 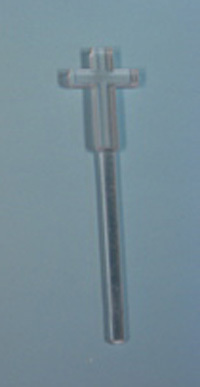 TOP is 6mm (1/4") Dia. TWIST is 5/16"H x 3/16" Dia. 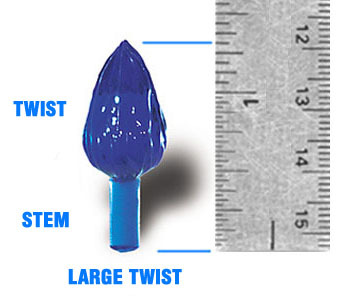 TWIST is 7/8"H x 1/2" Dia. 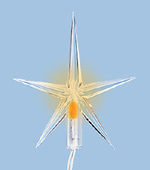 Gives off a soft glow at center of star. 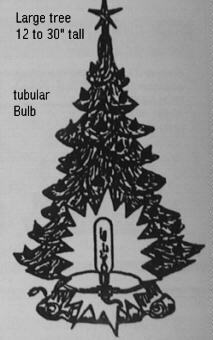 To install, inserted into hole on top of the tree & threaded down thru tree. 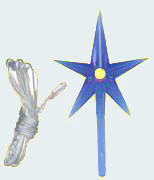 Star's wires are attached to terminals of the socket along with the regular power cord leads. 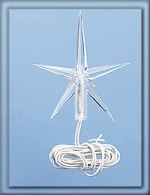 Wires are long enough so that tree can be lifted off base for Tree-bulb replacement. 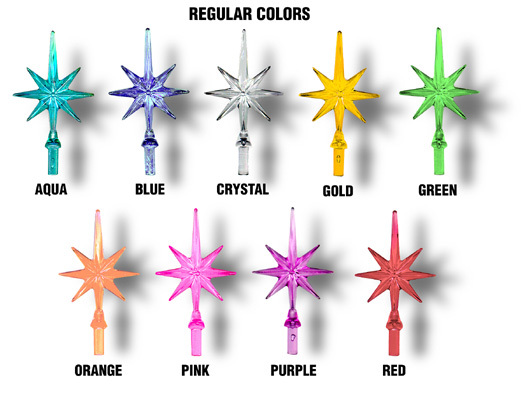 Can be ordered without star for lighting hard to get at places such as mini lamp posts. 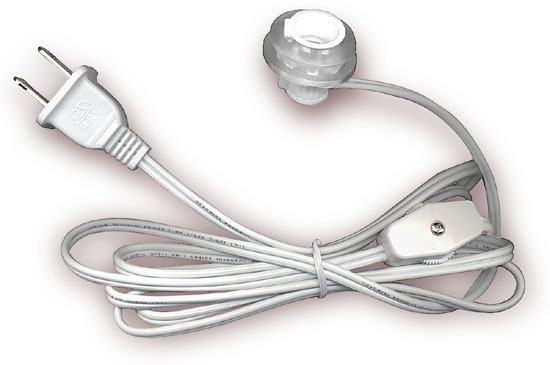 Attach to your power cord. 1/4 watt, for 110v with 40" lead. 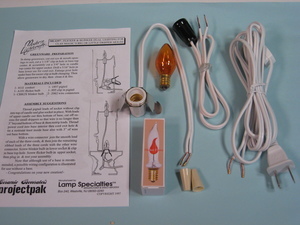 7-1/2W, 2-1/8"L tapered bulb Lighting Kit Clear Steady-Burning 7-1/2W, 2-1/8"L tapered bulb, candelabra bakelite socket, 8' cord with wheel Type On/Off switch, and mounting hardware and instructions. 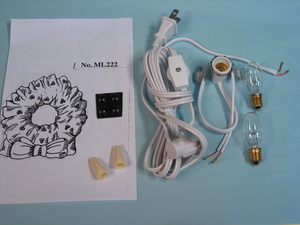 25W 2-7/8"L tubular bulb All kits include, Clear Steady-Burning 25W 2-7/8"L tubular bulb, candelabra bakelite socket,, 6' cord with plug and wheel Type On/Off switch, a 25w bulb with instruction . 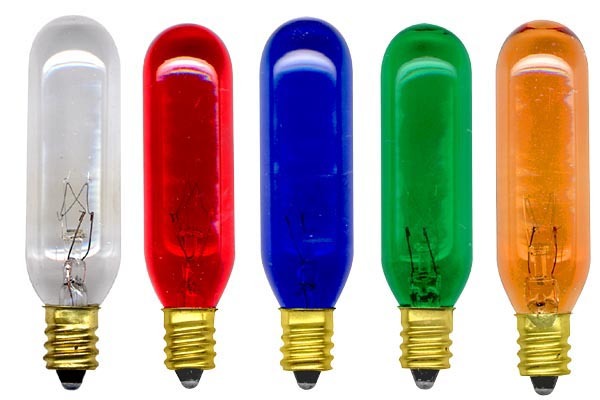 25W 4-3/8"L tubular bulb All kits include, Clear Steady-Burning 25W 4-3/8"L tubular bulb, candelabra bakelite socket,, 6' cord with plug and wheel Type On/Off switch, a 25w bulb with instruction . 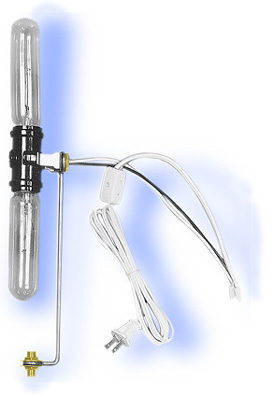 40W 5-3/8"L tubular bulb All kits contain a Clear Steady-Burning 40 watt, 5-3/8"L tubular bulb, standard base bakelite socket, cord with wheel Type On/Off Switch, mounting hardware, and assembly instructions. 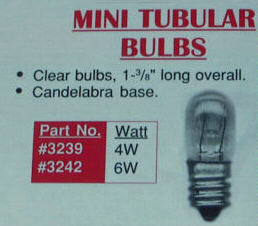 TWO.. 25W 5-3/8"L tubular bulb Lights up extra-tall objects. 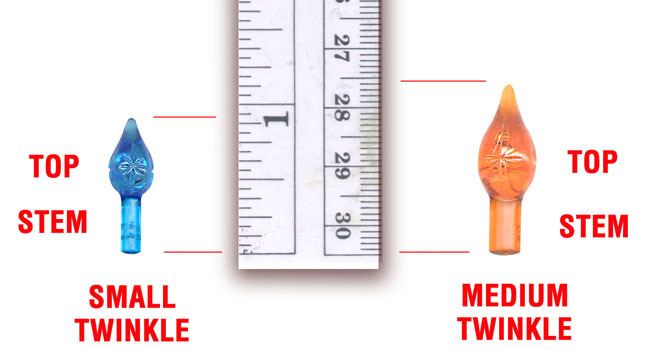 Measures 14"H from bottom of bracket to top of upper bulb. 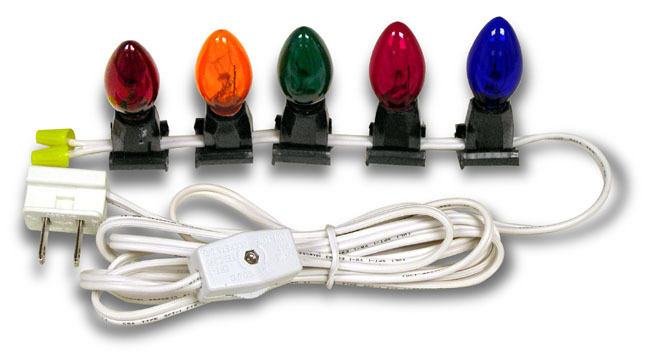 you position lights anywhere on the cord..
includes 8'cord with molded plug and in line switch 42" from cord end, Candelabra Sockets, and colored blinker bulbs. 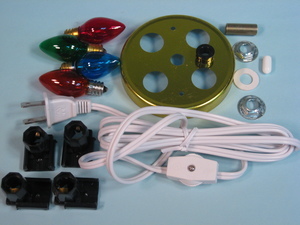 to light up Tampa Bay�s Wreath Mold. 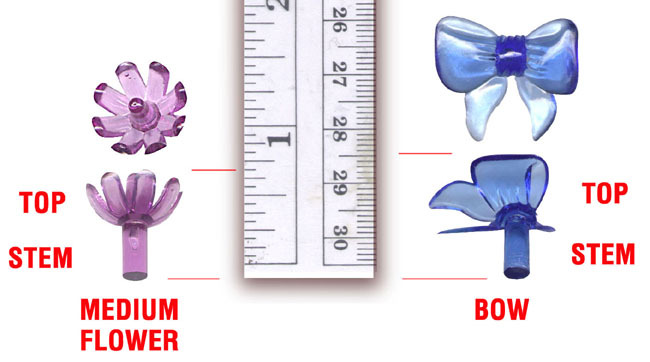 Can be adapted to fit other illuminated projects, as well. 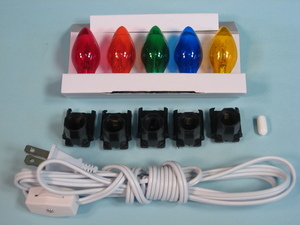 includes cord with molded plug and in line switch on cord end, Candelabra Sockets, and colored blinker bulbs. 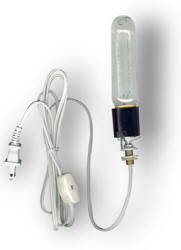 Lamp Cord with Socket and Plug. Threaded Sockets fit 1" opening. Cord exits from side of socket. 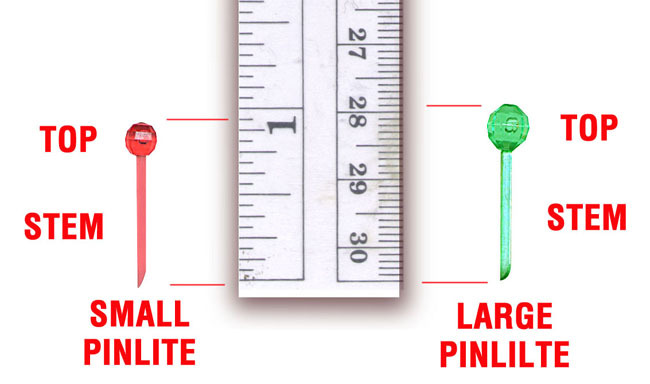 Has threaded mounting ring. Fits 13/16" opening. 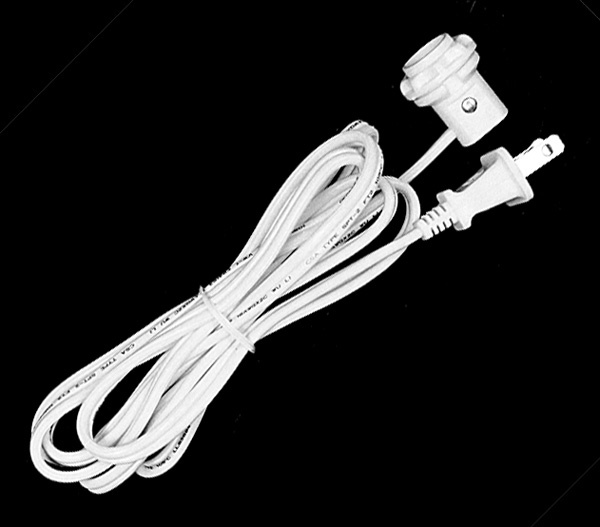 6' white cord exits from side of socket. Cord exits from side of socket. 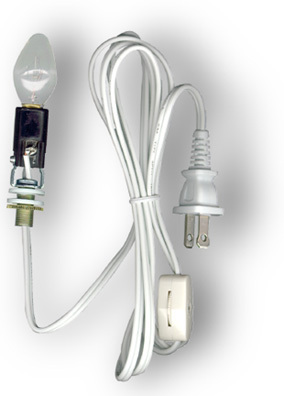 Lamp Cord with Switch, Socket, Plug. fit 3/4" or 1" opening. Cord exits from side of socket. 6' White. 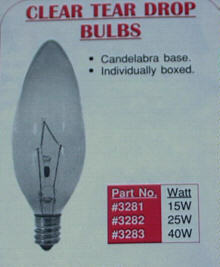 Light Bulbs are conveniently packed in boxes of 5. 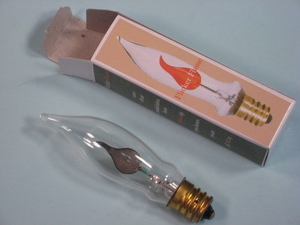 Tapered Light Bulb..Candelabra base ..
flickers like a real flame. 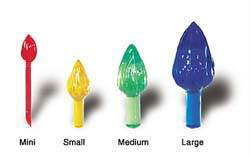 Clear Tear Drop Bulbs. 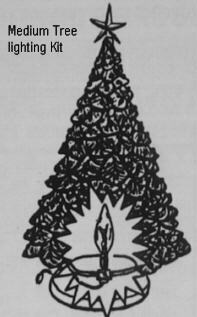 Candelabra base. 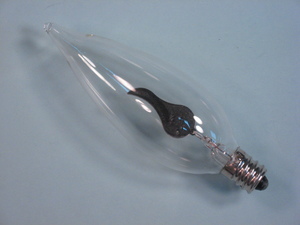 Clear Mini Tubular Bulbs, 1 3/8" long overall. 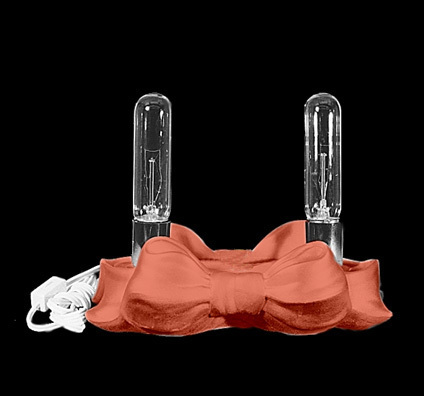 Candelabra base. If you don't see what you need please ask. All pages © Streamers Country Ceramics 1997 thru 2018. All rights reserved.